Russ Garner says he was just three years old when he knew what he wanted to do in life. He wanted to be a country and western singer. The inspiration came after he’d listened to records played on his grandparents’ Victrola and to Grand Old Opry late at night on their radio. More than 70 years later, Garner is still living that dream, much to the enjoyment of scores of admirers throughout the region. For generations, anyone who liked country and western music has wanted to hear Garner’s rich bass voice and his expert guitar strumming. Long-time fans, some of whom have listened to him for more than 50 years, say there’s been no decline in Garner’s performances, even though he was forced to take a couple of breaks from his career. “He has a smooth, rich sound. His voice is as good as ever,” said Cleone Hoyda of Crawford, who has frequently played the keyboard and provided vocal support when Garner performed. “Music just flows out of him. “He’s a hometown boy who made good. He’s very professional. He won’t sing a song until he gets it to perfection. He’s put Crawford on the map as far as music is concerned and it’s never gone to his head. He’s just Russ,” Hoyda continued. Garner was born on Feb. 20, 1932 in Alliance while his parents, Russ and Minnie, were living in a dugout on Trunk Butte Creek, about six miles southeast of Whitney. When he was 8, his mother gave him a setting hen. After the chicks were grown, he sold them and bought his first guitar and an instruction book for $10. About the same time, Golda Harrison, his teacher in the first and second grades at the Windy Hill School, gave him piano lessons and taught him to read music after school three times a week. His parents helped by purchasing a pump organ for him. “I learned all the chords and picked up the rest by ear,” he said. When Garner was 15, his parents moved to about five miles north of Crawford, where he still lives. Before long, he began playing with local dance bands and recalls that while they were still in their teens and it was illegal for them to sing in bars in Crawford, he and his long-time friend, Dwain Soester, were performing in Hot Springs. Before he was 20, he had organized his own band, “The Night Riders” that included Bob and Midge Rinker of Chadron. Garner was drafted into the Army in 1953 and spent a year in Korea as a truck driver. Even then he made music. He found an old Japanese guitar and frequently entertained his fellow troops with country songs. About the time Garner was discharged, radio stations KCSR in Chadron and KCOW in Alliance were going on the air. Live talent was in demand to fill air space, and there were plenty of willing participants who liked to sing country tunes. One of the popular programs over KCSR was “Curley’s Corral,” hosted by Bill Finch (who was actually bald), co-owner of the station, on Saturdays from the stage of the Pace Theater in Chadron. 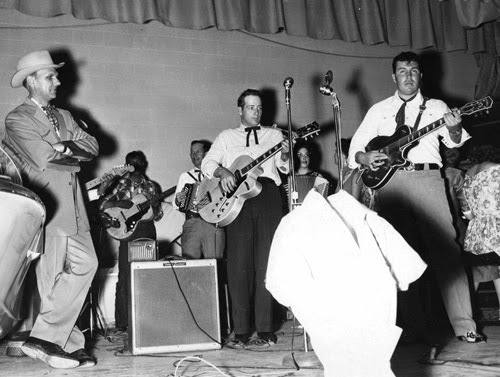 Russ was among the performers, along with Ellis (Peabody) Hale of Crawford, Joe Crossdog of Pine Ridge and Harry Hanson, Gordon Benson, Guy Jones and Howard and Dave Parker of Gordon. This "Curley's Corral" photo was taken in the late 1950's, probably at the Chadron Community Building. Left-to-right foreground are: Bill "Curley" Finch, John Ludwig, and Russ Garner. Ellis "Peabody" Hale can be seen in the background on the accordion. Garner said in those days he could hear a song a couple of times and soon have it ready to sing. He surmises that he’s known at least 1,000 country and western songs that he could croon instantly when someone in the audience made a request. He fondly remembers when the musicians union to which he belonged had him, Hale and Rinker form a band to back Reeves during a performance at Assumption Arena in the late 1950s. After Reeves sang for about half hour, he took a break and turned the microphone over to Garner for about 30 minutes before returning. Garner spent most of the 1960s in California. He often drove a truck or worked on freeway construction during the days and sang at nights and on weekends in various venues. 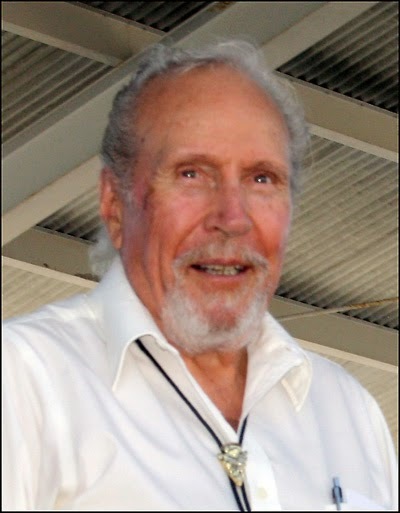 “River Man” is one of 15 singles Garner has recorded. He also made two albums with other performers and wrote several numbers that various artists have recorded. Besides being popular in California, Garner and the Rivermen had a six-week stint at the Golden Nugget casino in downtown Las Vegas and spent six months performing at the 4 Seasons Night Club in Denver. 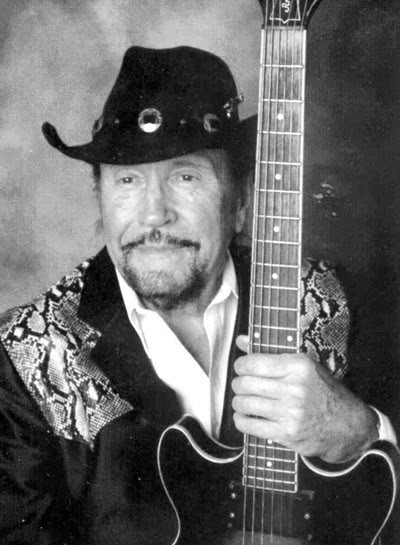 While at the 4 Seasons, he played in the band that backed Marty Robbins and LeRoy Van Dyke. He was doing a three month gig in Ketchikan, Alaska, in March 1964, when that area was hit by a strong earthquake that sent the residents scurrying to the top of a nearby mountain. Later in the decade, Garner worked several weeks at a time in some of the bigger clubs in the Los Angeles area, including the Palomino Club in North Hollywood and George’s Round-Up in Long Beach. He even had his own radio show over a station in Pomona and during the mid-1960s the Russ Garner Fan Club was formed by a female admirer, Darlene Talley of Spokane, Wash., who had it so well organized that it won several awards and had members as far away as England and South Africa. Late in the 1960s, Garner also participated in a USO Tour to Europe. His career had a setback in 1974 when, after returning home to help operate the family farm and ranch, he was bucked off a horse he was trying to break. One of Garner’s wrists was broken when he landed on the ground and the other was broken when the horse stepped on it. After recovering, Garner went to Nashville, where he both performed and promoted some of the songs he had written. Earlier, one of his tunes, “Tear Stained Guitar,” was recorded by Red Sovine on the Starday Label. Highlights in Nashville included several weekend appearances on Ernest Tubb’s Midnite Jamboree. “Tear Stained Guitar” and another version of the song, “The Strings of My Guitar,” are often requested when Garner is performing in this part of the country. In 1982, Garner and a partner opened a bar in Box Elder, S.D., called Nashville North and featured his music and a new band, “The Renegades.” Lawrence and David Hewitt, brothers from Chadron, played in the band. He also sang throughout western South Dakota and into Wyoming and Montana, and always returned to Crawford to sing and play on the Fourth of July. Another setback happened to Garner in the early 1990s. After about 40 years of constant singing, nodules formed on his vocal cords and he was silenced. It was even a bigger concern than the broken wrists because he didn’t know if anything could be done to correct the problem. He consulted several doctors and submitted to surgery, but surmised his singing career had ended. It was nearly a decade before he finally was able to sing again to his own satisfaction. But he didn’t sit around while waiting for the recovery to happen. He moved to Iowa and got a job delivering Winnebago motor homes throughout the continental United States and into Canada and Alaska. He now looks back on the experience as an interesting one and feels fortunate that he’s driven at least two million miles in the last 60 years without having more than a minor accident. “I’ve enjoyed everything I’ve done and often think about how lucky I’ve been,” he said. It was nearly eight years ago that Garner was able to return to his favorite activity - strumming a guitar and singing country tunes. He’s got a new band these days, made up of Jack and Renae Jones and Elizabeth Tuning, all of Crawford, and David Neilson of Lance Creek, Wyo. They meet each Wednesday night to practice. Renae said she and her husband feel privileged to be working with Garner. She recalls that when she was a youth living in Lusk her family would come to Crawford frequently to hear him. She also noted that her husband’s grandfather, Guy Jones of Gordon, was among those on programs with Garner during country music’s heyday in western Nebraska in the 1950s. Through the years, Garner has often performed at the Veterans Home at Hot Springs, the nursing home in Crawford and for dozens of benefits. He’s one of the primary attractions the third Sunday of every month when the Eagles Club in Crawford holds is monthly jam. Last month, the session was dedicated to Garner as friends helped him celebrated his 77th birthday.